Keston Scholar Alina Urs presented a public lecture, "Gender and Faith in Former Communist Countries: Yesterday and Today" on Thursday, November 13, at 3:30 pm in the Michael Bourdeaux Research Center in the Carroll Library. Urs graduated from University of Oxford, St. Antony’s College, with a Master of Science in Russian and East European Studies. 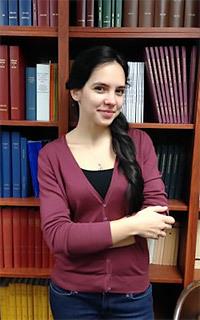 Twice a Keston scholar, she conducted research at the Keston Archive and Library in 2013 on "The Romanian Orthodox Church in the 1970s-1980s: The Fate of the Dissident Believers." She currently works as an expert at the Institute for the Investigation of Communist Crimes and Memory of the Romanian Exile, a government institution in Bucharest, Romania. She previously held the titles of researcher and project coordinator at the Centre for Studies in Contemporary History and at the Centre for the Investigation of Communist Crimes in Romania. Prior to those positions, she served as a program coordinator at the Bucharest Office of the Konrad Adenauer Foundation on matters related to the recent past and European Union integration. The scholar’s current research interests focus on mechanisms of repression during the communist dictatorship in Romania and on church state-relations. She co-authored the forthcoming book "Dimensions of Repression: Women in Communist Prisons."